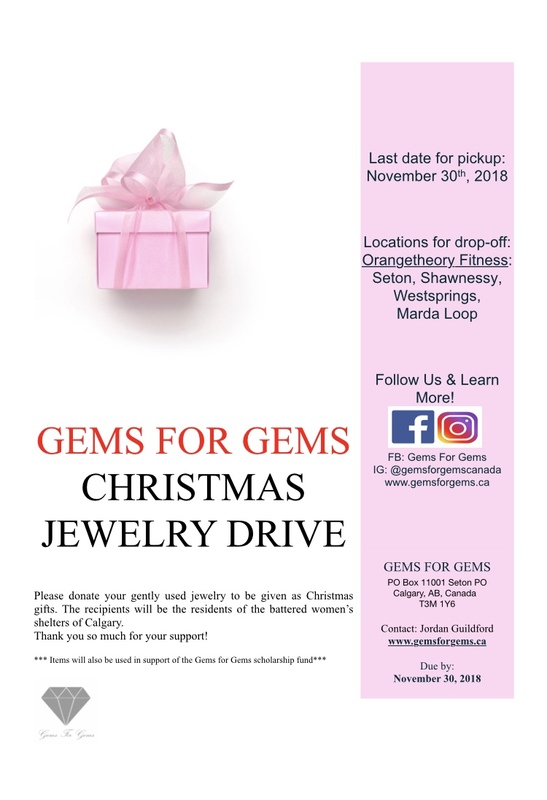 Gems for Gems began in 2015 as a Christmas Jewelry Drive in which the women of Calgary donate their gently used jewelry. It would then be cleaned, packaged and given as a Christmas gift to those who had experienced abused and were currently residing within Calgary shelters. Our childhoods all vary in one way or another and my variation was the other. We were living in Nova Scotia and had very little always and sometimes, we didn’t have what most would consider the basics. The situation between my Mum and Dad was a complicated one with both sides feeling they were doing all they could. However, the end reality was that our Mum was the one looking after us on a day to day basis with whatever contributions were possible from our Dad. Much time was spent attempting to make our existence a magical a childhood as possible with very few resources. Christmas after I turned 14 my brother, sister and I pooled our money together, (this amounted to about $50) and collectively bought her the most beautiful item we could afford. It was an antique-looking bracelet with clear, tiny gem stones encrusted throughout and we were so excited to give it to her! Prior to this year we each would have saved around $50 to spend on the entire family so the usual gifts for Mum were socks, mittens. This year, we had stepped it up and we couldn’t wait! When Mum opened it Christmas morning she beamed, cried, then smiled more and eventually she told us that it meant so much to her and she didn’t take it off all day. From that day forward, each time she wore it she also put on make up, did her hair and wore her best clothes. This tiny thing had reconnected her with being a woman and an individual which were things she had lost touch with due to having been a life source to we three for so many years. After having this personal memory come to mind, I decided to try to give that feeling to each woman in a similar spot as my Mum in Calgary. To give them a boost by reconnecting them with being a woman and an individual and to show them, they have not been forgotten. Thus, Gems for Gems was created! The first year we gave gifts to 436 women, we have now been able to go across Canada and to a couple countries overseas! This is such a beautiful testament to Canadians as it highlights the ‘Canadian way’ of being there for each other in times of need. The Jewelry Drive would not have had the impact it has if it wasn’t for the kindness of Matt and Reem Smolley. They stood by this initiative from the beginning, rallying their staff to spread the word and allowing their Calgary South Orangetheory Fitness locations to be drop off spots for the community and their members. Everyone woman touched by this initiative has them to thank for the success of this program. Our ‘Gems’ (our team of incredible volunteers) are crucial spokes to the Gems for Gems wheel. All programs and drives would not be possible without their endless support and selfless giving. I would like to leave you with a heartfelt thank you to all of you who have participated, donated and even liked or shared on social media. None of this is possible without every level of support given. You all contribute to this movement.